Hello all! Happy Independence Day to my fellow Americans! Just wanted to give you guys the heads up! There are going to be several changes coming to LU in the following weeks! First off there will be a new layout! We've had this one for quite awhile and we need a change of scenery! Never fear, the lovely Anna over at Lunazul Graphics (which made the current layout) will be designing it for us! It's sure to be amazing! There's going to be some new content and some cutting or rather morphing of some old content. Mostly I'm talking about the OTM's instead of having Fiction and Video of the month we will now have recommended Fiction and Video pages. It's just too hard to keep up with making all the graphics and searching out new content for these every month! Hopefully you will welcome this change. As always you can submit fiction and video to be included in these sections! The Site of the Month will stay intact and hopefully with just one graphic to make I can keep it up to date as well as keeping other sections of the site more up to date! Speaking of up to date! 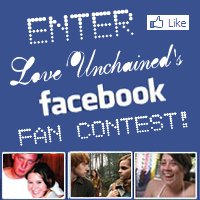 We have also updated the Facebook Fan Contest! It has been completely re-vamped so please visit that page to find out details on how you can win 25$ for HP tickets or a 10$ Barnes & Noble gift card! Also LU has hit the 500 mark on Twitter! That's right over 500 crazy people are following us on Twitter! If you're one of those you can enter our Twitter contest! All you have to do is RT @LoveUnchained is My Favorite #Romione website! We will automatically enter you for a chance to win a customized Twitter background and matching avatar! Winner will be picked at 2pm EST July 15th so please make sure to get your tweet in by at least 12:30pm EST!